Celebrating the holidays in Europe. Opens in a new window. Bold decor and cozy rooms, Tea and coffee machines are a plus. Where to find Marais hotels near an airport? How can I find hotels in different Marais neighborhoods? Where can I find hotels in Marais that are near tourist attractions? If you're thinking of planning to stay in the Paris region and you're looking to book a hotel in Marais, you have a wonderful range to choose from. You'll find 1898 hotels within 0.1 kilometres (0.06 miles) of downtown Marais on our informative and up-to-date booking section. Visitors hoping to find accommodations conveniently located to the heart of Marais, can choose from the Pavillon de la Reine and Hôtel Le 123 Sébastopol - Astotel. Travelers on a budget will be pleased to learn that there is a nice range of lower-priced hotels and apartments in the vicinity of Marais. The Austin's Arts et Métiers Hôtel is 0.6 kilometres (0.4 miles) from the main part of Marais, while the Hôtel du Haut Marais is 0.4 kilometres (0.2 miles) away. 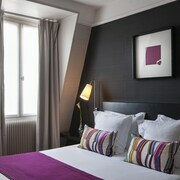 Two more options in the lower price range include the Hôtel Bastille De Launay and the Hotel France Louvre. 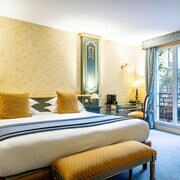 4 kilometres (2 miles) away from the heart of Marais, is the Le Bristol Paris. The Mandarin Oriental, Paris can be found 3 kilometres (2 miles) away. 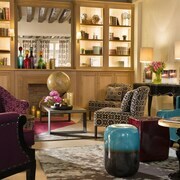 Two other Expedia-registered hotels include the Le Royal Monceau Raffles Paris and the Shangri-La Hotel Paris. The wider Ile-de-France region is worth visiting too. Check out Ile-de-France's castles, old towns and historic mansions and photograph its forests and rivers. Common activities in this particular part of France include city walking tours and culinary tours. 9 kilometres (5 miles) away from Marais you'll find Courbevoie, where you can enjoy Parc du Millenaire and Leonardo da Vinci Engineering School. 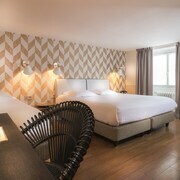 Some of our recommended Courbevoie hotels and accommodations are the Résidence Alma Marceau and Hotel Raphael. 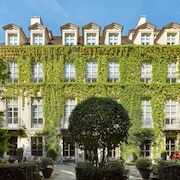 4 kilometres (2 miles) to the southwest of Marais, you can also stay at Left Bank, home to the Hôtel Barrière Le Fouquet's and Le Burgundy. If you stay in Left Bank, set aside a little time to check out the Beaugrenelle and Senses Garden. Orly Airport is a convenient airport, and is 14 kilometres (9 miles) away from Marais. Nearby accommodation options are Mercure Paris Orly Rungis and Hilton Paris Orly Airport. What are the most popular Marais hotels? 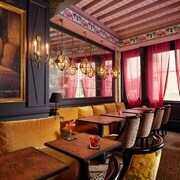 Are there hotels in other cities near Marais? 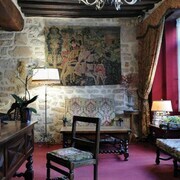 What other types of accommodations are available in Marais? Explore Marais with Expedia.ca’s Travel Guides to find the best flights, cars, holiday packages and more!